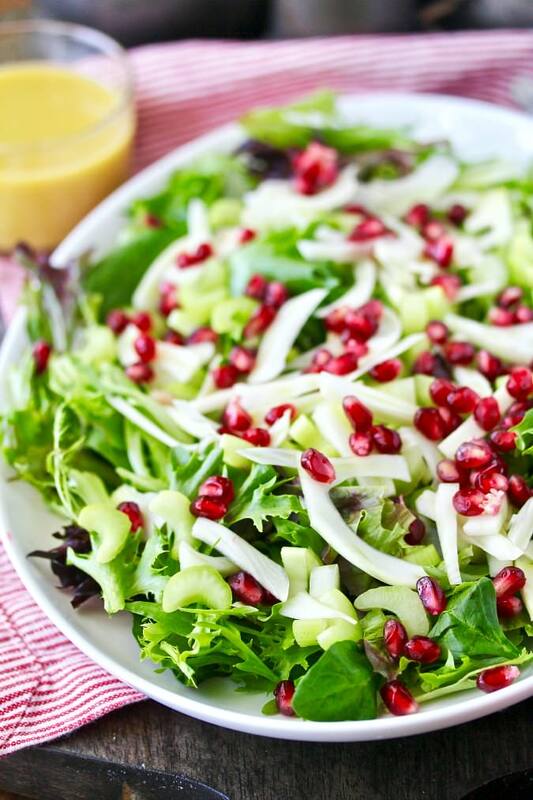 Fennel, Pomegranate, and Arugula Salad with a Honey Mustard Vinaigrette Recipe. 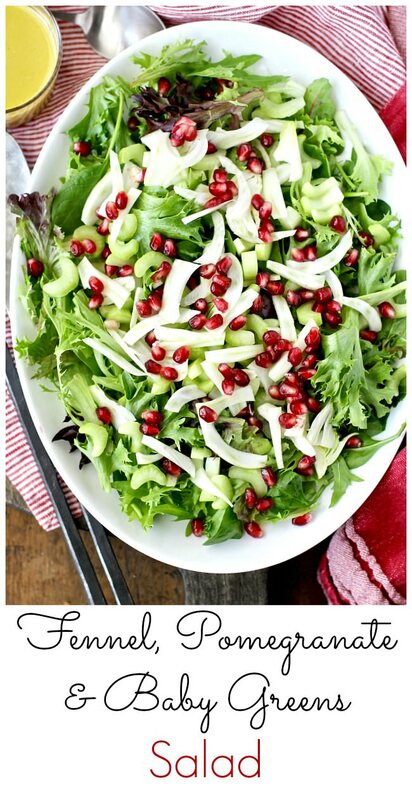 This fennel, pomegranate, and arugula (and other baby greens) salad is both gorgeous and delicious. The salad is super crunchy from the fennel and the celery, and the honey mustard vinaigrette with champagne vinegar is tangy and delicious. I have vague memories of eating home grown pomegranates and getting the juice all over my hands (and my clothes). Our southern California climate is perfect for growing pomegranate trees. It is an amazing fruit, and I just wish I had more room in our tiny yard so I could plant a pomegranate tree. Evidently, the pomegranate is also rumored to be a seductive fruit, according to The Daily Meal. For example, the first pomegranate tree was rumored to have been planted by Aphrodite. In fact, some scholars believe that the apple that Eve tempted Adam with in the Bible was actually a pomegranate. I've also read that in Turkish weddings of the past, the bride tossed a pomegranate to the ground and the amount of seeds that spill out represented the number of children that she will bear. Knowing the pomegranate's history, I made this salad for this week's From Our Dinner Table Sunday recipe round up. The theme is Valentine's day. 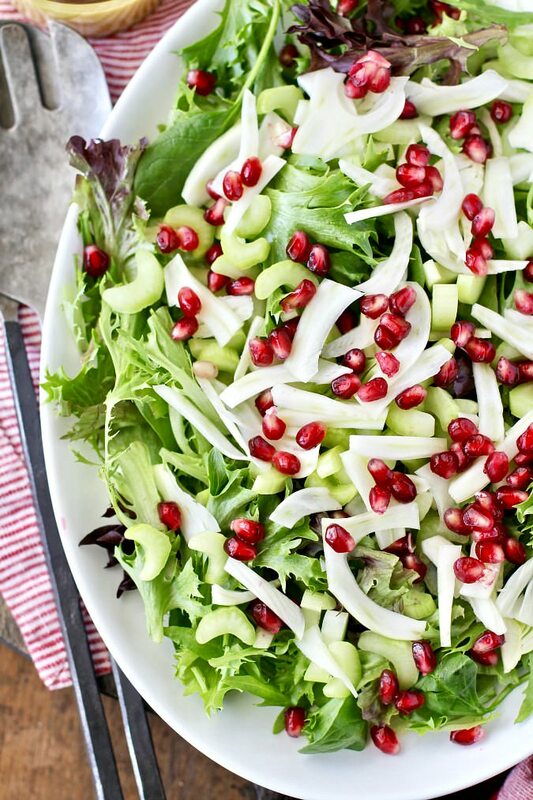 I'm pretty sure that the gorgeous color of the pomegranate arils in the salad and the allegedly "romantic" nature of the fruit would be a lovely addition to a Valentine's day dinner. 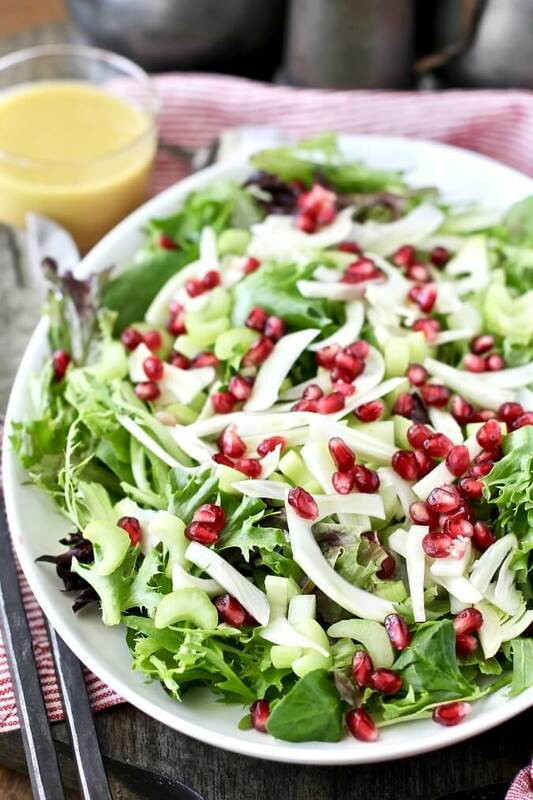 To make this salad in advance, just assemble the veggies and pomegranate arils in a bowl and refrigerate. Next, mix the vinaigrette ingredients, emulsify, and then refrigerate. About 20 minutes before serving the salad, bring the dressing to room temperature. Add the dressing to the salad and toss to combine. This is my new favorite salad. I now wish pomegranates were available year round! We share Recipes From Our Dinner Table! Join our group and share your recipes, too! While you're at it, follow our Pinterest board, too! How do you seed a pomegranate? There are so many tricks and tips, but for me, the best way is to cut the pomegranate into quarters and place them in a bowl of water. Dig out the arils with a small spoon or your fingers and then strain them from the water. There are also non-staining pomegranates available. In this case, just cut the fruit into quarters and dig the arils out with a small spoon. In a medium bowl, whisk together the lemon juice, mustard, champagne vinegar, honey, and salt. Add the olive oil and whisk briskly until emulsified. Place the baby greens on a platter. Top the greens with the fennel and celery. Sprinkle the top with the pomegranate arils. Top with the vinaigrette to taste and toss. Serve the salad with more dressing on the side. This looks like such a delicious salad! I love the combination of the fennel and the pomegranate. So much flavor! I love the pop of color from the pomegranate...so pretty! 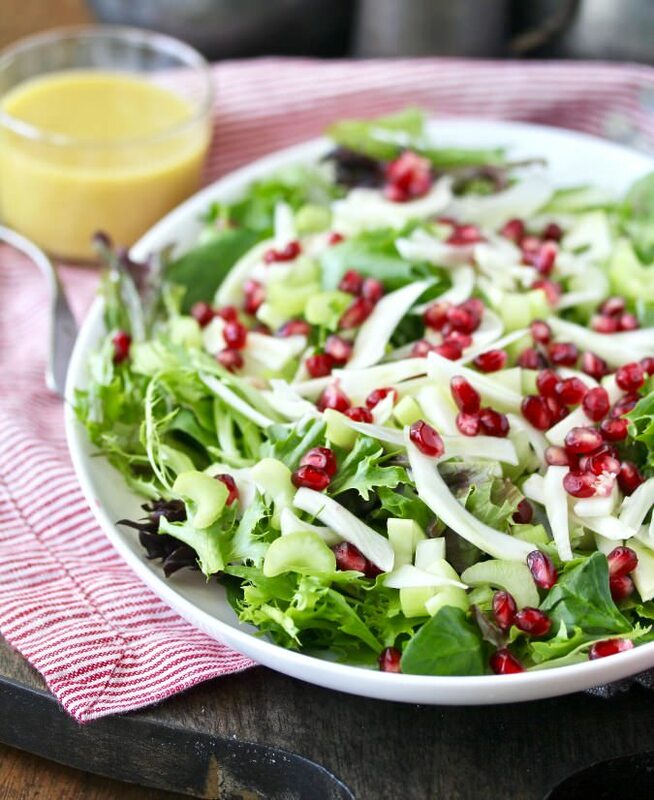 Such a bright, beautiful winter salad. In addition to Valentine's Day, this would be a great addition to a Christmas dinner table! Such a festive looking salad! I love the pop of color the pomegranate give this dish. This salad sounds so good! It's pretty too! I absolutely love this salad Fresh flavors and the vinaigrette is perfect! What a simple and lovely salad. Plus it features 2 of my favorite ingredients, fennel and pomegranate seeds. There is nothing like a new combination of favorites to make me realize that cooking is the process of finding the right mixtures in an world of infinite possibilities. And this is definitely one of the right ones! Awww. Thanks so much my friend!